The first ever winner of the Craig Stewart Award will be crowned on October 25th, as the Dingos hold our annual awards night. The award has recently been named after club legend Stewy, who returned to Australia in the 2013 offseason after playing 181 games (club record), kicking 358 goals (also a club record), winning six best and fairest awards (club record), and attending twelve consecutive footy trips (also a club record). It looks as though neither of 2013's winners, Wade Edwards (best Aussie) or James Duggan (best Canadian), stand a chance of repeating, after they combined for only 6 games this season. Here's a look at some of the favourites to take home the hardware, with many new names in the mix. Alex Aitken: A new Dingo in 2014, this Robert De Niro lookalike was a consistent performer in the midfield who gathered plenty of the ball in every match he played and was usually listed in the best. A late season shoulder injury could hurt his chances, although he still has the shortest odds $3. Tom Humphries: 2014 was Thumper's first season in the red and black, and he didn't disappoint. Claiming several best on grounds and consistently dominating out of the middle makes him a red-hot favourite to claim the inaugural "Stewy". Could missing round one to see The Lion King hurt his chances? $2.25. Shaun McKay: The captain finished the season strongly and could be a late bolter. Known for his run and long kicking off half-back, as well as his luscious curls and never-ending 5th quarters, "Sloppy" is a decent bet to win his first B&F for the club $3.50. Tom Bell: The 2012 winner and 2014 AFL Ontario All-Star, Tom is a good bet to win "Best Canadian", and has a decent chance of claiming the Stewy outright. Always a strong performer in the ruck and around the ground, the Honeybeard frontman recovered well after his 2013 season was hampered by a severe footy-baseball injury $4.50. 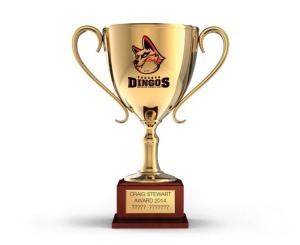 Dave Wells: The other Dingo on the 2014 AFL Ontario All-Star Team, Wellsy was reliable at full back whenever he played. Spending half the summer reading Margaret Atwood novels at his cottage will hurt his chances, but he will give Tom Bell a close contest in the "Best Canadian" category $7. Chris Buczkowski: The Cronut King snagged 13 goals in the last two matches of the season and will definitely poll well in both those matches. An outside chance for Best Canadian $41. Mike Karas: "High School" Mike returned from China after serving a 12 month sentence for being the caboose of the Dingo Train to play the final 5 matches of the season. The team won all but one of the matches that he played, and Mike was an integral member of the backline $41. Tim McKay: Tim didn't manage a game in Div.1, however there is a very strong chance that he will be confused for his brother and be on the receiving end of a few votes $51. Tom Evans: The frequent flyer only played two matches, but was Best on Ground both times. A very long shot, it looks like Tom will again be relegated to hosting "Tom's Chairs and Seats" in 2014, rather than basking in glory $101. Many other awards will be given out on the night, including Div.2 Best and Fairest, Leading Goalkicker(s), Best Rookie, Best Clubman, Most Improved Player, and Life Membership.